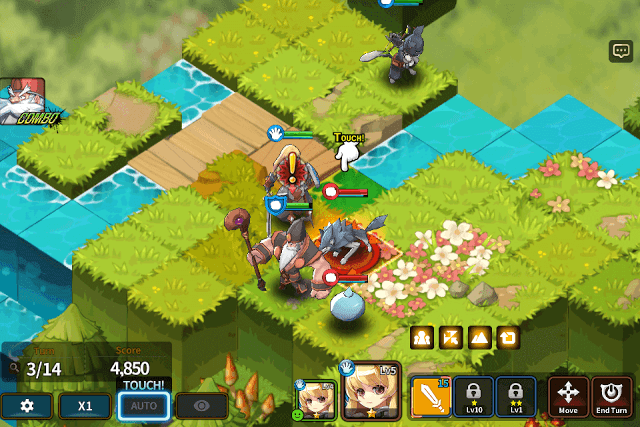 Fantasy War Tactics is probably the best looking tactical role-playing game available for iOS and Android devices. The game has splendid visuals and animated battles. Gameplay is very similar to Final Fantasy Tactics Advance. You control a 5 member party on a 3D isometric battlefield, move them to strategic positions and attack monsters in turn-based battles. The only drawback about this game is the lengthy dialogues exchanged between characters. Thankfully, there’s a skip button that lets you bypass the conversation and go straight to battle. 1. Pulling off a combo attack is easy. All you have to do is make sure your hero is close to a party member or members and the monster(s) you are targeting is within the range of your party member(s) first skill attack. You can pull off multiple combos if the enemy is within the range of more than one party member. Cooperate strategy is the best way to inflict double, even triple damage to one or more enemies. 2. Try to move your hero to advantageous terrain when battling monsters. To know what terrain is advantageous to your character, go to “Hero” on your home screen and tap on your recruited hero’s portrait. You will find “Advantageous Terrain”, just beside “Cooperation Bonus” at the bottom of his or her info screen. It shows a portrait of the terrain block. 3. When your hero moves to an advantageous terrain, a golden icon is shown above him. If he moves to a neutral terrain, a blue diamond will be shown above him. A red diamond with a skull mark is shown on disadvantageous terrain and having your hero in disadvantageous terrain can do more bad than good to him. Raised tiles show they are advantageous to your hero units. 4. Attacking an enemy from the side or from the back can inflict 15 percent extra damage to him. In auto battle mode, the AI takes great care in implementing this strategy. Under auto battle, the hero will move to an enemy’s back or to his left/right whenever it gets an opportunity to pull off a direction attack. 5. Touch a hero’s first, second or third skill to make him/her move to a monster that is within his attack range. This will help you identify only those monsters that can be attacked by your hero. 6. Your hero will inflict 30 percent more damage if the enemy he is attacking has a type weaker than his type. Try to move your hero to a weaker enemy type on the battlefield whenever you get an opportunity. If your hero type is weaker than the enemy type, then you will inflict 25 percent less damage. 7. Take a Higher Level Mercenary to Battle. Before battle starts you will be able to summon a player’s hero as an extra ally. The list will show more than one mercenary. Choose a higher level hero. A mercenary’s level can be seen at the top left corner of his/her portrait. Use the mercenary when one of your heroes are down and have a very low HP. You can use the mercenary for three turns. While using a mercenary, your low-health hero will regain some HP. Once his 3 turns are over, you can switch to your recovered hero. As you progress through the missions, you will receive high-quality weapons and gear. You should equip your character(s) with better gear to make him more powerful. 1. Go to Equipment. To your left, you will see currently equipped weapons and armor beside each player portrait. To your right are weapons and gear that you have collected in battles or received as rewards. 2. 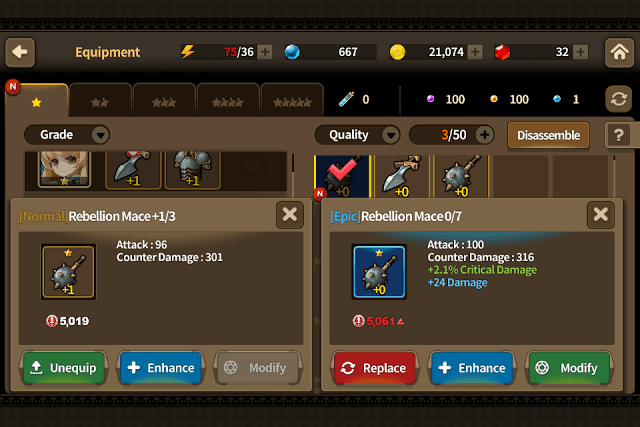 Tap on the currently equipped weapon that you want to replace with a new weapon. Next, tap on the new weapon. You will now see both weapons and their info side by side. (Check screenshot). 3. Now check the combat power below the new weapon’s portrait. A red arrow icon beside the combat power number shows that the new weapon is more powerful than the existing one. 4. 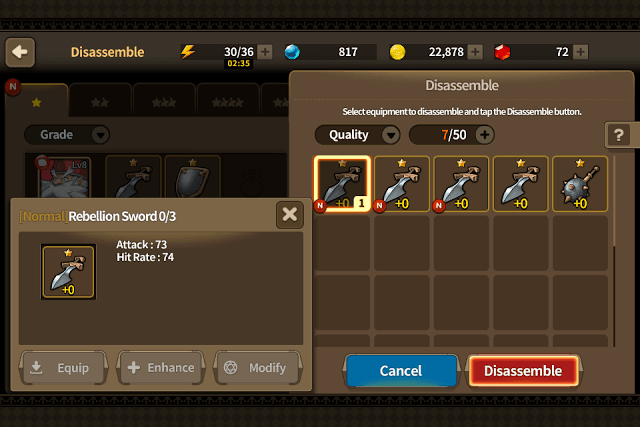 If a red arrow is shown, tap on “Replace” under the new weapon’s portrait to equip your character with it. A blue down arrow icon beside the combat power number shows that the new weapon isn’t as stronger as the currently equipped one. While battling enemies, move your hero to a strategic position or closer to an enemy and tap on the skill button to make strategy symbols appear on the screen. The symbols can be found just above the skill buttons. All or a few symbols will light up when you press a skill button. Strategy symbols will help you know which strategies will come into play when you launch an attack on an enemy, helping you to move to a better spot or choose a better strategic location to make all symbols light up. If your hero’s current spot makes only two strategy symbols light up, you may choose to move to a new spot or to a different direction to see whether more strategy opportunities can be activated or not. The first symbol is Cooperate (People symbol): This gets lit up when there’s an opportunity for a combo attack. The second symbol is Advantage (black and white arrows): This gets lit up when your hero has type advantage (Rock-Paper-Scissors) over an enemy. You will inflict 30 percent more damage to a monster if this symbol gets lit up. Third symbol is Terrain (Mountain symbol): This gets lit up when your hero is positioned on an advantageous terrain. Fourth symbol is Direction (Arrow): It gets lit up when your hero is positioned behind an enemy or to his left or right side. When all strategy symbols are shown, you inflict powerful attacks. It will also fill the Lord Gauge faster. Make the most of them to defeat main bosses and hard-to-beat monsters. Once you are ready for battle, tap on “World Conquest” and then select a region. Tap on a level. An info box will appear on the screen. Just below “Difficulty”, you will see a magnifying glass icon. Tap on this icon to know what type of enemies your party will encounter in that level. Under “Monster Info” you will see the number of monsters you may encounter as well as their type (Rock, Paper or Scissors). 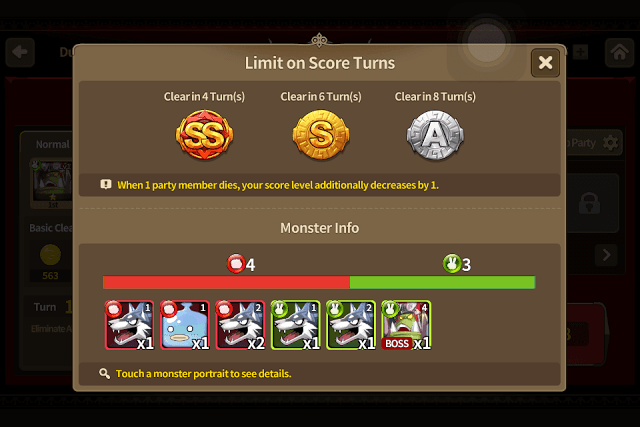 You may even tap on a monster portrait to check key stats, such as Area of effect, Attack range, Active and Passive Skills and its level. Once you have identified your monsters, build a strong party based on the enemies you will encounter in that level. If there are more Rock type enemies, then have two Paper type heroes in your team. If there are fewer “Scissors” type enemies, then have more rock and paper type hero units in your party. You may even have a balanced party consisting of heroes belonging to all three types. Don’t forget to equip your heroes with the strongest weapons and armor and then go out to battle. 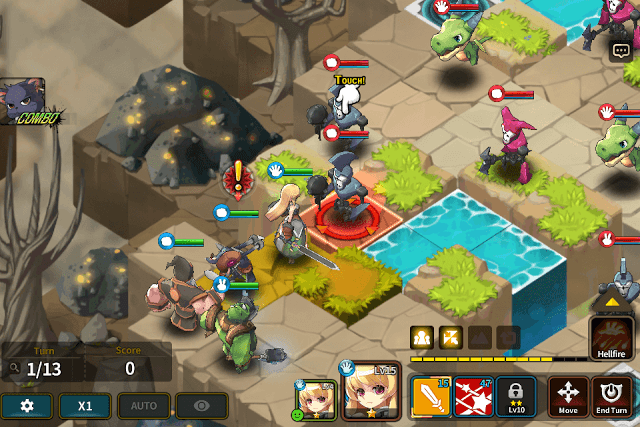 In Fantasy War Tactics, stories can earn you big rewards. The “Story” icon is located to your left on the game’s home screen. You will need to scroll down to find it. It’s below “Friends”. An “N” icon above story indicates that new stories are available to read. Tap on it and press the “Check the Story” button to launch a new tale. You will also notice rewards beside this button. You will receive it soon after ending a story. Tap on “Claim Rewards” to get your reward. Dissemble unwanted weapons, armor and magical items for extra coins and materials. Tap on an item and then tap on Dissemble to get rid of it. Send heroes on expeditions to earn EXP and item rewards. A legendary weapon/armor will bound to a hero if equipped. You can’t unequip such items unless you have spent red crystals for it. When playing a “Scenario Dungeon”, you can skip the dialogues exchanged between characters. You will still receive your rewards. Scenario dungeons rarely contain battles and are mostly conversations between NPCs and party members. Don’t forget to check the achievement section from time to time. Completing achievements will earn you rewards like gold and red crystals. An “N” icon above it shows that a new achievement has been unlocked.